Expand and create an entirely new living space with an award winning basement renovation for your Winnipeg home. Recapture the space occupied by stacks of boxes, old toys and dusty books. Let Harwood transform your basement into a family functional entertainment space, new bedroom, office, exercise room or maybe a completely new suite for a family member or tenant. What do you need to store, big items, small items? Do they require cool space? How much storage space do you require? Where is the best place to accommodate it? Our storage solutions are creative and incredibly efficient. We can transform previously unused space into completely functional storage solutions. How much and what type of lighting is required? Should you use pot lighting? This requires some additional space in the ceiling so it is not possible in all basements. Perhaps wall scones, table or floor lighting are more suitable. Proper lighting is critical to creating the exact ambiance you're after. Do you need light and bright or are you looking for more cozy and comfortable? Harwood professionals will work with you to create the exact environment you're looking for. There's nothing worse than going to plug in your new floor lamp and not finding a convenient electrical outlet. Or trying to connect to the internet only to find you renovations company didn't consider data lines. We spec. everything down to the last detail so there's no surprises when you go to plug in the hot air popcorn popper or go to download your favorite movie! Ceiling type - Gyproc or suspended will depend on ceiling height. Flooring - Sub floor requirements, laminate, hardwood, carpeting, tile? Trim & Moulding - Add character and architectural details with trims and moulding. Plumbing requirements - putting in a wet bar? New bathroom? Don't forget you need water! What are you waiting for? 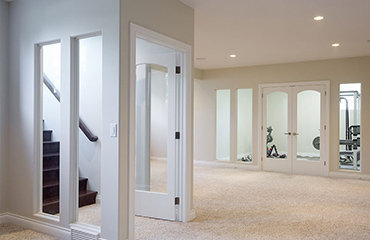 Expand your living space with an award winning basement renovation from Harwood. View our gallery to see some of our award winning basement renovations. "I just wanted to make sure I formally thanked you for our fantastic basement. The whole process was great, we were fearful given our workloads that we could never manage it and you made that part easy and I cannot tell you how much we appreciate that. Your guys are great and it was totally comfortable having them in our house, so thank them as well. Then there is the actual basement, it looks even better than it was in my head! Last night we just went down there and sat and admired it."